Women's Health has revealed Michelle Obama's secrets for sculpting her bionic, headline-grabbing arms. For the first time the First Lady's personal trainer Cornell McClellan has detailed their regimen, which he says he's put Obama through since 1997, starting at 5:30 a.m. "She's truly committed herself to the importance of health and fitness," McClellan says. "I believe the purpose of training is to tighten up the slack, toughen the body, and polish the spirit. To do that, we take a holistic approach that includes strength, cardiovascular, and flexibility training." Get the deets here! Media Overhype: Michelle Obama’s Shorts! Just when the media world calmed down over First Lady Michelle Obama exposing her arms in sleeveless dresses, the frenzy begins again as Michelle reveals her legs in a pair of shorts! On a recent family trip to the Grand Canyon in Arizona, the First Lady donned a pair of slate blue shorts and some critics are questioning whether that's an appropriate attire for a woman of her rank. 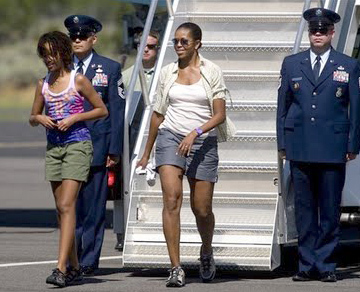 Blindie thinks the real faux pas is that Michelle is wearing a pair of "mom shorts." Similar to mom jeans, mom shorts are just as unflattering and should be banned from the American wardrobe. But we're not mad at Michelle, because her legs look great! 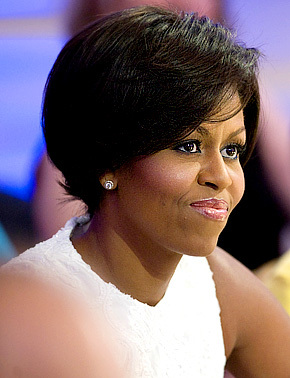 After her Rainbow Brite skirt DON'T, we were seriously questioning our First Lady's style...but after Michelle Obama debuted this sleek new bob on Tuesday, we fell in love with her style all over again. The gorgeous figure looked stunning as she and the president hosted a country music celebration in the White House's East Room with Brad Paisley and Alison Krauss. What do you think? 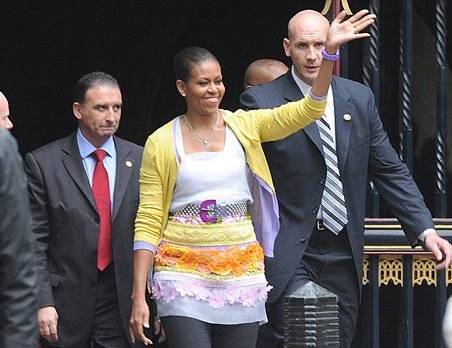 Wearing a skirt that resembles something little Sasha could've made in her arts and crafts class, Michelle Obama sabotaged her fashion resume with a Rainbow Brite/Wedding cake skirt on a trip to Westminster Abbey. The First Lady, who is on summer vacation in the UK with daughters Sasha and Malia, "brightened up London's grey skies," according to The Sun, with her yellow and lavender layered cardigan and crazy skirt, which The Times says, "As a stack, they look like one of those modern, fancy wedding cakes that brides’ co-ordinate with their flowers." Also, what's going on with her hair? She's looking a little coneheadish. Obviously, you can all see that Blindie is not happy with this style mishap! The Obamas may be American royalty, but they're spending their time as Parisian tourists this week. Wrapping up his six-day trip abroad to the Middle East, Germany and the beaches of Normandy, the President joined First Lady Michelle and Malia and Sasha at the U.S. ambassador's residence in Paris, where they're staying. The First Family's tour of Paris began early Saturday evening at the Notre Dame cathedral, while on Sunday (which was Sasha's 8th birthday) they took in the city's best view atop the Pompidou Center. "I would love nothing more than to have a leisurely week in Paris, stroll down the Seine, take my wife out to a nice meal, have a picnic in Luxembourg Gardens," he said after taking his wife to dinner near the Eiffel Tower. "Those days are over, for the moment." President Barack Obama made good on a campaign promise to wife Michelle and treated her to dinner and a Broadway show in New York City on Saturday. The first couple arrived in Manhattan on a Marine One helicopter after flying into JFK airport aboard a Gulfstream 500 jet. They dined at the Greenwich Villge restaurant Blue Hill and took in the revival of August Wilson's "Joe Turner's Come Home" at the Belasco Theatre in midtown. Crowds lined the streets, cheering and waving, as the presidential motorcade made its way through the streets. Always one to find fault with the Obama administration, the Republic National Committee crticized the President for jetting to New York for what they deemed as "a night on the town" during a recession and as General Motors prepares to file for bankruptcy -the fourth largest in U.S. history. 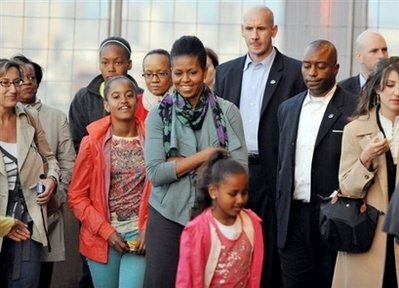 The Obamas paid for dinner and theatre tickets themselves while taxpayers will foot the bill for the plane ride, estimated by The New York Post at $24,000 per aircraft (3 were required for the trip), and for police security.